Ford's latest Mondeo range, now available in UK dealerships, is available with a new high-tech 1.6-litre direct injection turbo petrol EcoBoost engine which offers sporty performance while returning a claimed 41.4mpg. The new engine joins the 2.0-litre EcoBoost engine which was introduced across all Ford's large cars earlier this year. Sharing the same direct-injection, variable valve-timing and turbo-charging, the new 1.6-litre version, produced at Ford's Bridgend Plant in Wales, is also available on the new Ford C-MAX range. In five-door form, the new Ford Mondeo equipped with the 1.6-litre 160bhp EcoBoost engine and six-speed manual transmission is capable of 134mph, while returning a claimed 41.5mpg (combined) and emitting 158g/km of CO2. Ford's 1.6-litre EcoBoost engine uses a combination of turbocharging, direct injection and variable cam timing to reduce fuel consumption and emissions while producing an extra 40bhp over the Mondeo's conventional 1.6 petrol engine. It also produces a remarkable 10 per cent more power than Ford's 2.0-litre 145bhp petrol engine. 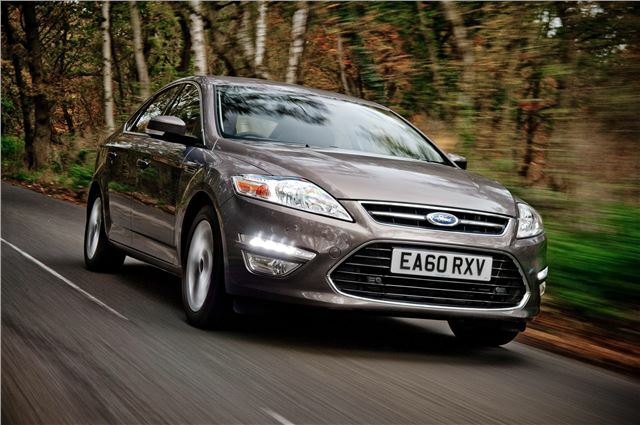 Further Ford Mondeo powertrain news follows in February next year when the 1.6 TDCi diesel engine with start-stop technologies arrives in UK showrooms. This Mondeo, targeting 115g/km CO2 to return 65.6mpg (combined), features a specially calibrated 115bhp version of the Dagenham-built engine and will be fitted with an aerodynamic kit to minimise drag and low rolling resistance tyres. The 1.6-litre EcoBoost engine will also be available this year in Ford S-MAX and Galaxy. With power output at 160PS, the engine produces CO2 emissions of only 164 and 169g/km respectively.